An Seabhac also gives the alternative name An Sliabh Dubh [TCCD], 'the black mountain'. Previously Gowlane Beg in MV. An Cnapán Mór is the 202nd highest place in Ireland. I took in Gowlane Beg while walking across the Central Dingle range from Connor pass to Anascaul. Only the glorious Corca Dhuibhne could hide an undiscovered gem such as this. Views to die for in all directions. 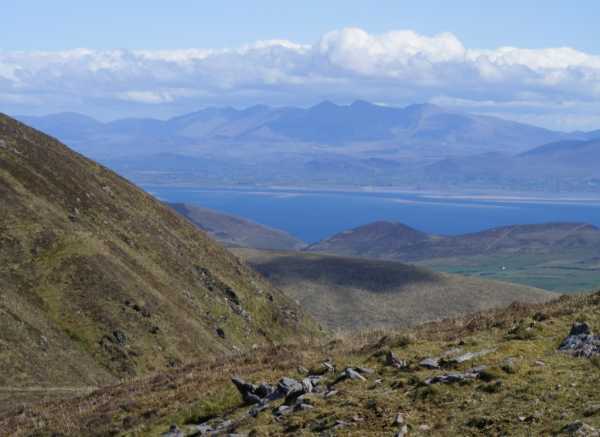 On one side, across the surprisingly green and fertile plain of Lios Póil, and beyond Dingle Bay, the entire tumble of mountains stretching from Mount Hilary near Mallow to the Skelligs at the western end. To the north, the lonely lake speckled mountain plateau (Com an Air - Valley of the Slaughter) that stretches from Anascaul to the Conair Pass, and beyond that to Brandon Bay and the mighty ocean.